In 1531 Juan Diego, a poor Aztec Indian, encountered a “Lady from Heaven” surrounded by a ball of light as bright as the sun when walking through Tepayac Hill in northwestern Mexico City on his way to chapel. She told him she was “the Mother of God” and that she desired a church built on this site where people may experience her compassion and love. She urged him to run to the Bishop to tell all that he had seen and heard. After two times of trying to see the Bishop, Juan Diego returned home. He was met by the Mother of God who told him those famous words found at the shrine in Mexico: “My little son, am I not here who is your Mother? Do not be afraid.” (“No estoy yo aquí que soy tu madre?”). She told him that the bishop would have his sign, the proof of her apparition. The next day Juan ran to see his uncle, who was mortally ill. Miraculously, his uncle was cured. Juan then was met by “the Lady from Heaven” again and instructed to pick full-bloom, Castilian roses growing in the dead of winter on a nearby hillside. Removing his tilma (a poncho-like cape made of cactus fiber), Juan Diego cut the roses and put them in it. When he went to the Bishop again, he threw open the tilma and the roses fell out. However, the Bishop was more impressed by the image of the Blessed Virgin Mary imprinted on the tilma, precisely as Juan Diego had described her, than the exotic roses. Guadalupe could be a Spanish mistranslation of the local Nahuatl word that Mary probably used, “Coatlallope,” which means “the one who treads on snakes,” as found in Genesis 3:15 about the Blessed Virgin Mary treading on the head of the snake. The tilma, which has been studied throughout the years, has been subjected to such dangers as smoke from fires and candles, water from floods and torrential downpours, and in 1921 a bomb was planted by anti-clerical forces under the altar. An iron cross was next to the tilma, and when the bomb exploded, the cross was twisted out of shape, but the tilma was untouched. In 1977, scientists examined the tilma using infrared photography and digital enhancement techniques. Their findings were inconclusive since the method of painting the image is still unknown. In fact, the painting of La Guadalupe is inexplicable. The paint and colors cannot be explained. The picture is imprinted on a poor quality cactus-cloth that should have deteriorated within 20 years, but it has shown no sign of decay 484 years later. The painting still defies all scientific explanations of its origin. Recently, ophthalmologists have studied her eyes and have concluded that they reflect what was in front of her in 1531 — a bishop and a gentleman with a cloth and flowers. The tilma itself is a miracle. The image has layers of meanings for all of us. Her earth-colored dress covered by a blue mantle show the meeting between the earth and heaven. The sash around her waist signifies that she is pregnant; in Spanish one says the same using the idiom, “Ella está en cinta,” which literally means that “she is in a sash.” The stars on her mantle are the same constellations that had occurred in 1531. 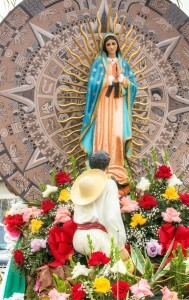 Her darkened skin color represent the indigenous people of Mexico, and her stance with a lowered head and folded hands show her reverence to God. After her appearance millions of indigenous persons were converted to Catholicism. Believers have great love and admiration for “La Morenita” (“The Dear Dark Woman”) as they know that she intercedes for all of us to her Son, Jesus Christ. For that reason, at 6 p.m. on Saturday, Dec. 12 there will be a procession through the streets of Norristown and the Mexican business district to show how she leads us all to Christ. Along with statues of La Guadalupe and Juan Diego, priests, religious sisters, seminarians, a band, dancers, choirs and believers will process to St. Patrick Church. At 7 p.m. there is a beautiful Mass with La Virgen y Juan Diego surrounded by thousands of roses of every color and many fervent believers in her power to care for and love unconditionally her children. La Virgen de Guadalupe is our Mother, the Mother of God, who brings us all to Christ as we say, “Through Mary to Jesus.” Pray to “The Empress of the Americas,” and she will take good care of all of you in South, Central and North America and bring your requests and petitions to her Son, Jesus Christ. ¡Qué Viva la Virgen de Guadalupe!